I had another tragedy. Yes, I broke the same nail that I broke before doing my last manicure. This time though, there was no saving the length, all nails needed to be nubbed. It was okay in the end since my nails were kind of in bad shape and peeling and could have used a drastic trim down. So, I grabbed my clippers and chopped everything down. I was kind of bummed about the length, especially since before the last break my nails were perfect. I debated about not painting them and just leaving them naked until they grew out, but I couldn't bring myself to do so. I started looking for short nail art ideas, and I remembered Magnifique Nails who has shorter nails which ALWAYS look amazing. She is so talented. 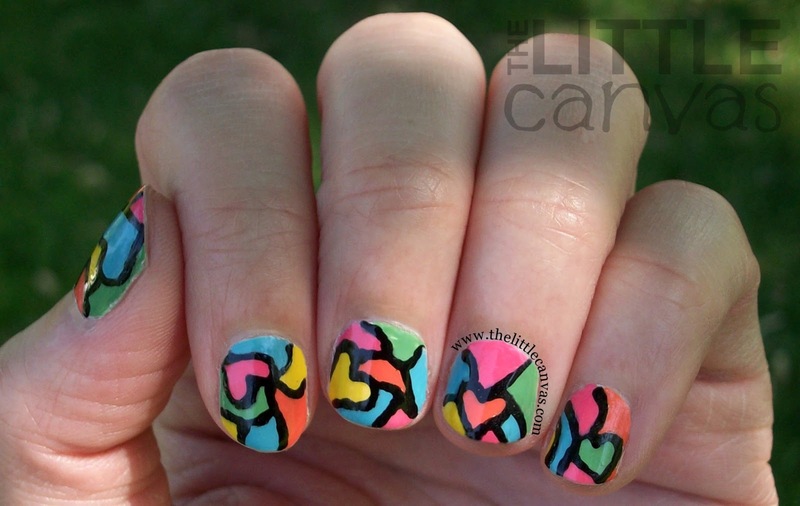 After scrolling around her blog, I found this manicure. Now, I knew I couldn't copy it exactly how she did since I'm not that talented, so I took my own little spin on it. I'm happy with how they turned out. Nubby, nubs which were colorful and cute. I love working with the Zoya Stunning collection since they are such full colored creams. They are also super easy to work with when using dotting tools or toothpicks to fill in small areas like on these nails. I wasn't sure that I would get a lot of use out of Josie, but it is quickly become one of my favorite green polishes. It's the perfect leaf/grass color, and well as a nail artist who enjoys flower manicures, this is a must have. I have so many ideas for the other polishes too, but I'm waiting for summer to tick on a little more before I do so. To get the look, I basically what I did for my color block nails. I started off with a base coat of white polish. Since my pure white is goopy, I used OPI My Boyfriend Scales Walls since it is a pretty decent one coat polish. I didn't worry if it was streaky in some areas since I was planning on totally covering the base with the colors. 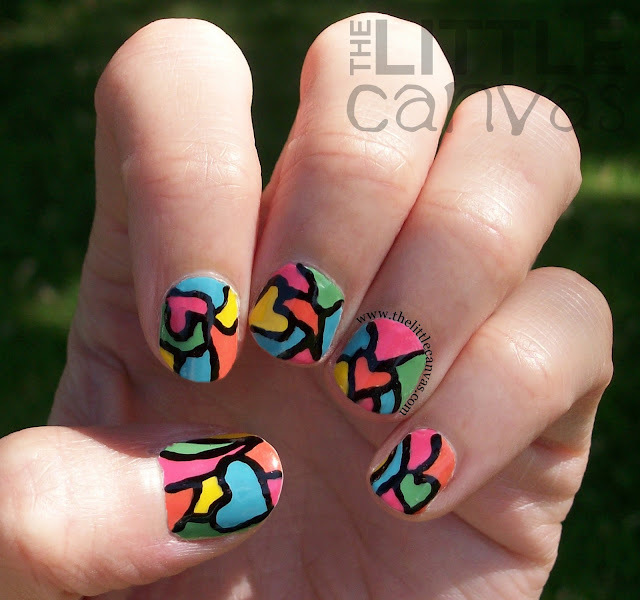 With my nail art brush and black polish, I painted on the "stained glass" outlines. Then, with my dotting tool, I filled in the white spaces like a coloring book. When the colors were completely dried, I went back over the black lines with a nail art brush to make them stand out and clean up any overflow from the color dotting. What do you think? Love, hate? 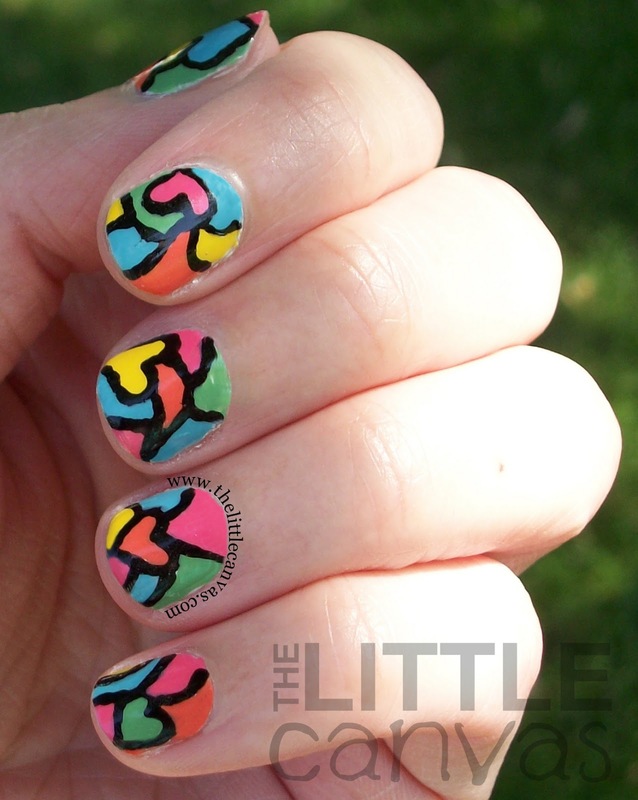 Have you tried the stained glass/color block look? I still see my color block nails to be a tad messy. I'm hoping with more practice the lines become neater. It definitely takes a steady hand and some patience. Seriously, I think to do both hands, this manicure took at least an hour and a half. After the 45 minutes of doing my left hand, I really didn't want to do my right hand. I should probably start painting both hands at the same time instead of doing one hand completely then moving on. hmmm.